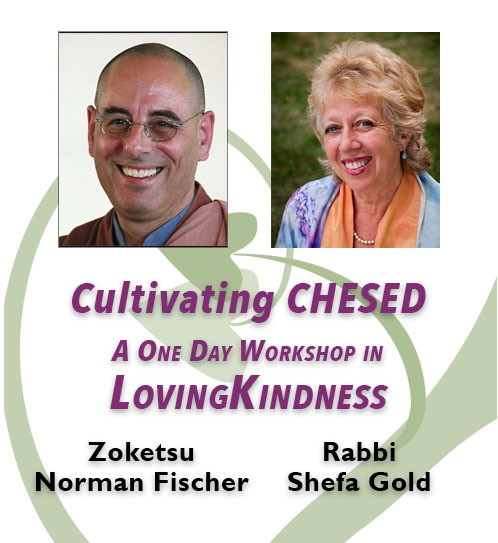 A day-long workshop led by Zoketsu Norman Fischer and Rabbi Shefa Gold, in which we will use meditation, chant and teaching to explore and deepen our lovingkindness practice. Zoketsu Norman Fischer is a poet, writer, meditation teacher, and Zen Buddhist priest. A former abbot of the San Francisco Zen Center, he is founder and teacher of the Everyday Zen Foundation. He is also co-founder, with the late Rabbi Alan Lew, z”l, of Makor Or, a Jewish meditation center in San Francisco. Since the 1990’s he has been active in Jewish meditation around the U.S., at various synagogues and retreats. He isalso involved in the Awakening Heart Project, founded by Rabbis Jeff Roth & Joanna Katz. For more information, see www.everydayzen.org. High Holiday services for the past three years.